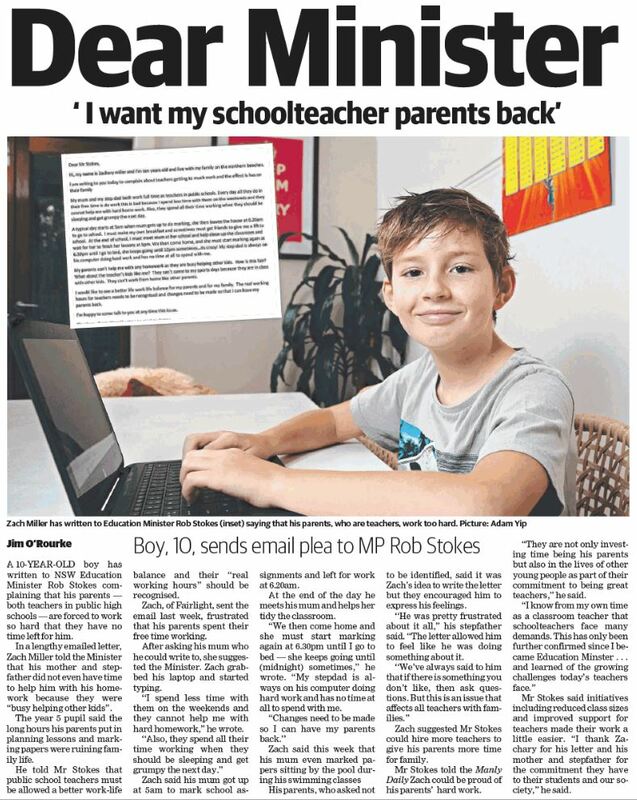 A 10-year old boy has written to NSW Education Minister Rob Stokes complaining that his parents – both teachers in public high schools – are forced to work so hard that they have no time left for him. In a lengthy emailed letter, Zach Miller told the Minister that his mother and stepfather did not even have time to help him with his homework because they were “busy helping other kids”. The year 5 pupil said the long hours his parents put in planning lessons and marking papers were ruining family life. He told Mr. Stokes that public school teachers must be allowed a better work-life balance and their “real working hours” should be recognized. Zach, of Fairlight, sent the email last week, frustrated that his parents spent their free time working. After asking his mum who he could write to, she suggested the Minister. Zach grabbed his laptop and started typing. “I spend less time with them on the weekends and they cannot help me with hard homework,” he wrote. Zach said his mum got up at 5am to mark school assignments and left for work at 6.20am. At the end of the day he meets his mum and helps her tidy the classroom. Zach said this week that his mum even marked papers sitting by the pool during his swimming classes. His parents, who asked not to be identified, said it was Zach’s idea to write the letter but they encouraged him to express his feelings. “He was pretty frustrated about it all,” his stepfather said. “The letter allowed him to feel like he was doing something about it. Zach suggested Mr. Stokes could hire more teachers to give his parents more time for family. Mr. Stokes told the Manly Daily Zach could be proud of his parents’ hard work. “They are not only investing time being his parents but also in the lives of other young people as part of their commitment to being great teachers,” he said. Mr. Stokes said initiatives including reduced class sizes and improved support for teachers made their work a little easier. “I thank Zachary for his letter and his mother and stepfather for the commitment they have to their students and our society,” he said.